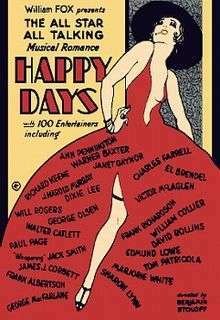 Happy Days is a 1929 American Pre-Code musical film, notable for being the first feature film shown entirely in widescreen anywhere in the world, filmed in the Fox Grandeur 70 mm process. French director Abel Gance's Napoléon (1927) had a final widescreen segment in what Gance called Polyvision. In 1927, Paramount released Old Ironsides with two sequences in a widescreen process called "Magnascope". In 1928, MGM released Trail of '98 in a widescreen process called "Fanthom Screen". The film features an array of stars who were contracted to William Fox's Fox Film Corporation at that time, including Marjorie White, Will Rogers, Charles Farrell, Janet Gaynor, George Jessel, El Brendel, Ann Pennington, Victor McLaglen, Dixie Lee, Edmund Lowe, and Frank Richardson. It also featured the first appearance of Betty Grable on film, aged 12, as a chorus girl, and Sir Harry Lauder's nephew, Harry Lauder II, a conductor for Fox, who was drafted into the chorus. Originally titled New Orleans Frolic, the story centers around Margie (played by Marjorie White), a singer on a showboat who goes to make her fortune in New York City, despite being in love with the boat owner's grandson. Although successful in the city, when she hears that the showboat is in financial trouble she calls all the boat's former stars to perform in a show to rescue it. After a preview on September 17, 1929, Happy Days premiered at the Roxy Theater in New York City on February 13, 1930 with a Niagara Falls widescreen short on a Grandeur screen of 42x20 ft, compared to the standard 24x18 ft screen. It was also shown in Grandeur at the Carthay Circle Theatre in Los Angeles, from February 28, 1930. At a screening at the Roxy Theater, film critic Mordaunt Hall praised the cinematography, which was noted to be enhanced by the wider format. However, he regarded the film itself as "... not one that gives as full a conception of the possibilities as future films of this type will probably do." Due to the Great Depression few movie theaters invested in widescreen equipment and the format was abandoned until 23 years later. Fox Film Corporation's heavy investment in Grandeur technology led to William Fox losing his business, which was eventually merged in 1935 with Twentieth Century Pictures to form 20th Century Fox. No widescreen print of Happy Days is known to survive. ↑ Coles, David (March 2001). "Magnified Grandeur". The 70mmNewsletter. Australia (63). Retrieved June 27, 2013. ↑ Mordaunt, Hall (February 14, 1930). "Grandeur's First Real Talker Shown: "Happy Days" William Fox's Film at the Roxy, Boasts Largest of Screens. Many Favorites in Cast Dialogue of Large Group Made Possible–Minstrel Show Imaginatively Staged.". New York Times. New York: The New York Times. Retrieved June 27, 2013.